It’s funny the direction that life takes and how one thing can lead to another; how life can change drastically in a millisecond and take you on a different path. Instinctually, we fight change because it’s uncomfortable and often means that we have to start all over. But life really doesn’t give you a choice. Things happen and we have to move on and move forward. 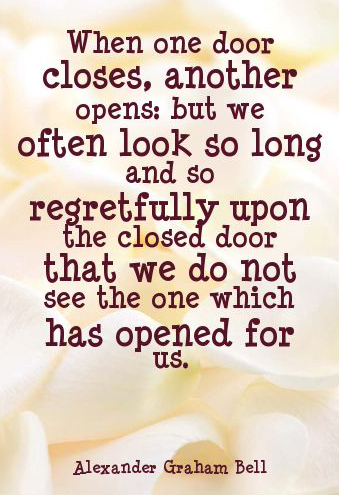 I really do hate to use those old clichés like, “when one door closes another door opens,” and “everything happens for a reason.” But they consistently seem to ring true, especially throughout the course of my own life. So let me start from the beginning and tell you a little bit about how I came to be who I am today. I remember as a young girl my parents were always very open and encouraged my sister and I to try new things. We were taught the importance of expanding our knowledge by trying new foods, new activities and going to new places. We were your normal middle class family, so I commend my parents for the opportunities that they afforded us, while often sacrificing what they wanted for themselves. I’m not sure if everything my parents taught us stuck, but I do know that their intention was to raise us to be open-minded and have the ability to adjust to whatever life dished out. While I’ll never be prepared for what life throws at me, I’ll always be prepared to adjust. I didn’t really understand this when I was younger, so let me take you back to high school and show you the road that led me here. I’ll never forget how badly I wanted to be a cheerleader in high school. But that was not meant to be. I just wasn’t good at it. So instead I was in the band. I joined in middle school and was very good at playing French horn, so I continued that and ended up joining the marching band. While in high school I also tinkered with writing by joining the newspaper and yearbook staff. Writing was always something that had been in the back of my mind. I loved reading and I loved writing, so naturally those classes seemed to fit me. But band was the thing in high school that led me to college. I ended up getting a scholarship and it paid for my first year of school. While in college I realized that I didn’t want to be a music teacher and I didn’t want the life of a traveling musician. So I had to reevaluate things. I gave up my scholarship and decided to go on to something else. The problem was that I didn’t know what that something else was going to be. It took me two years to figure out that reading and writing was something I loved, so I changed my major to English. In the midst of that, Barnes & Noble had brought their huge bookstores to college campuses. I knew that was somewhere I wanted to work. It encompassed everything that I loved. So I joined their management training program, with the hopes of obtaining a good job once I graduated, and it worked. I ended up getting a job that would require me to move back to South Florida, to run the FIU bookstore, and it was a really good paying job to boot. And that’s when the ball dropped. All of the adjustments I had to make in my life, up until this point, were fairly simple and fairly easy to do. But that wasn’t how the next decade would be. Unfortunately, I got sick and not one of the 16 doctors I saw could figure out what was wrong with me. I was covered in hives from head to toe, every single day and had abdominal pain on a consistent basis, which felt like appendicitis. To make things worse, two weeks before graduation I received the bad news, from my district and regional manager at Barnes & Noble, that my job offer had fallen through. So two weeks after the bad job news, my fiancé and I moved back down to South Florida. He had a hard time finding a job and I ended up working part time at the FAU bookstore, so we had to move in with my parents. Life was not good! I still didn’t know what was wrong with my health and battled that every day. So I focused on the thing that I had some control over, and that was my career. The job market had plummeted and it was really difficult to find any job I really wanted. So I started to substitute teach. From the moment I stepped into my first classroom, I knew that was where I was supposed to be. And so began my quest to get a teaching job. It really didn’t take long. I actually got a job at the first school I interviewed. I was to teach 11th grade honors English and I was ecstatic. And then the ball dropped again. Two weeks before the school year started, I got a phone call from the school saying that my job was no longer available. I won’t get into the dirty details, but let’s just say it wasn’t exactly kosher. I made a few phone calls and got a few interviews at other schools. It wasn’t long before I was offered a job at the school that I’ve been teaching at for the past 13 years. It wasn’t teaching honors, but it was a job and I was glad to have it. Toward the end of my first year of teaching, I remembered how much I loved writing for the school newspaper and I asked if I could take over the journalism class. I have now been the adviser for the past 12 years. My staff and I have won numerous awards over the years and it built my confidence up enough to start writing again. I also finally figured out what was wrong with my health. Among a ton of food allergies, I also suffer from Celiac Disease (can’t consume gluten). I was able to get that under control, though it is still a constant battle, and now I am in good health. It took a major change in my life to get healthy, but being sick made me realize how important it was to be happy and to do the things that make you happy. So a big change was on the horizon, and that meant having babies. Your own mortality smacking you in the face can really put things into perspective. Now that my health was back on track, having children was a reality and something my husband and I made a focus in our lives. After finally having two kids, and feeling inspired by them every day, I realized that I really wanted to write children’s books. And so began a new chapter. I enlisted the drawing expertise of one of my newspaper students, to be the illustrator for my children’s books. And all of our efforts paid off when our first book, The Castle Across the Street, won a 2014 Silver President’s Book Award from the Florida Authors and Publishers Association. We are now working on books three and four and having a blast. If I hadn’t failed at being a cheerleader, I wouldn’t have been in the band. If I hadn’t been in the band, I wouldn’t have gotten a scholarship for college. If I hadn’t gotten that scholarship, I wouldn’t have focused on music and realized that music wasn’t what I wanted my career to be. If I hadn’t changed my major to English, I never would have thought to work at the bookstore. If I hadn’t worked at the bookstore, I wouldn’t have moved back down to South Florida. Had it not been for moving, I wouldn’t have started substitute teaching and taken a job as an English teacher. Because I was an English teacher, I was able to teach journalism. If I hadn’t taught journalism, I never would have met my illustrator. And most importantly, if I hadn’t been through all of those health problems, I may not have taken the plunge to have children and do the things that make me truly happy. Hence, the reason I write children’s books today. Marilyn Monroe once said, “Sometimes good things fall apart so better things can fall together.” And she was right. Things won’t always go the way that you want them to, because they’re going to go the way they’re supposed to. I’ve learned how important it is to do what you love and embrace the glitches in the process that help you grow. Whatever my path, it led me here and I welcome the road ahead. I know it will be bumpy, but I also know that whatever happens will lead me in the right direction and take me to the place where I’m meant to be.